We’ve seen the Crew out and about, but still know very little about the little guys. 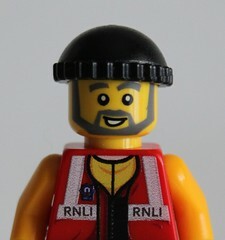 So as everyone starts to wind down towards Christmas, we take a moment to catch up with Coxswain Bob. Bob, thanks for taking the time to speak with us. Let’s start with some background. How long have you been on the lifeboat crew? I’ve been a member of the crew for the past twenty years and have been coxswain for the last six. How did you get involved with the lifeboat? Well, I was born and brought up here on the coast and my father was on the lifeboat crew for as long as I can remember. After I finished school, I went away to work but the lure of the sea was too strong and I eventually found my way back here. Though this time with my wife and kids in tow! Even though my dad had retired from the lifeboat crew by then, it didn’t take long for me to sign up. What does being the coxswain involve? I’m responsible for the boat and for the crew. This includes making sure that the boat is ready to go at all times and that the crew have everything they need to operate safely. When we’re out on a shout, I’m in charge of the boat and am responsible for all of the boat’s and the crew’s operations. But it’s a real team effort. We all work together to make sure that we, and any casualties, get home safely. Sounds like a big responsibility. Oh, it is. And it’s not a responsibility that I take lightly. The members of the crew and their families place an enormous amount of trust in me, in my skills as a coxswain and in my judgement when we’re out in sometimes terrible weather. To have earned that trust is a real honour. How have things changed over your time on the crew? The main change is the boats. When I first joined the crew, we were lucky to be able to make eight or nine knots. But today’s modern all-weather lifeboats can go at up to 25 knots or more. They’re much easier to launch and recover, too, which all helps to save time when it counts. And they are so much more comfortable for the crew and any casualties, which makes it much easier for us to stay sharp when we’re out all night. The crews have changed a lot, too. Not just here, but all around the coast. They’re no longer the preserve of fishermen and grizzled nautical types like me. Our crew comes from all walks of life. And we have quite a few women crew, too. But the thing that hasn’t changed is the dedication that all members of the crew show to their training and to the job that they have taken on. Not just the men and women out on the boats, but the shore crew and the many other volunteers who keep us going. What do you do when you’re not on the lifeboat? Just like everyone else, I have a family and a ‘day’ job. The kids are grown up now, but I still see them regularly and get to spend a lot of time with my grandchildren. Work-wise, I run the yacht brokerage and chandlery at the marina, which is right next to the lifeboat station. And I have two Labrador dogs, which fill up any free time that my wife and I might have left. How easy is it to combine work, family and the lifeboat crew? You get used to it. The team at work know that I sometimes need to rush off in a hurry. And my wife is exceptionally tolerant of me not always being where I’ve said I’ll be because my pager’s gone off. She worries about me when we’re out on a shout, as do the families of all of the crew members, but they know that we’ve got the very best kit and the very best training to help keep us safe. And finally, what’s the scariest situation you’ve been in on the crew? This entry was posted in Interview with the Crew and tagged Coxswain Bob, Interview, RNLI, The Lifeboat Crew by Simon Perks. Bookmark the permalink.